Here is my one of a kind plant stand. One of my favorite items to find in a thrift store are wood candlesticks, bowls and plates. I find that the wood ones are really easy to paint. 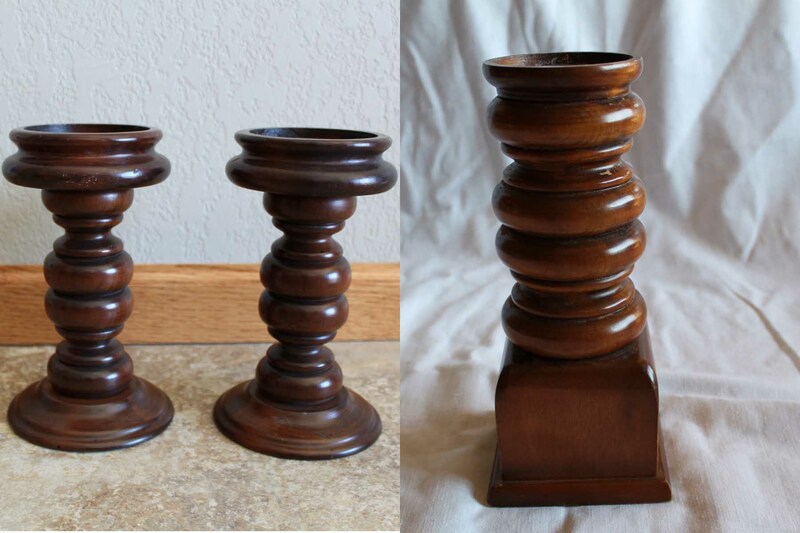 I found these candlesticks along with a wooden plate (no before picture of the plate) at thrift stores this winter. 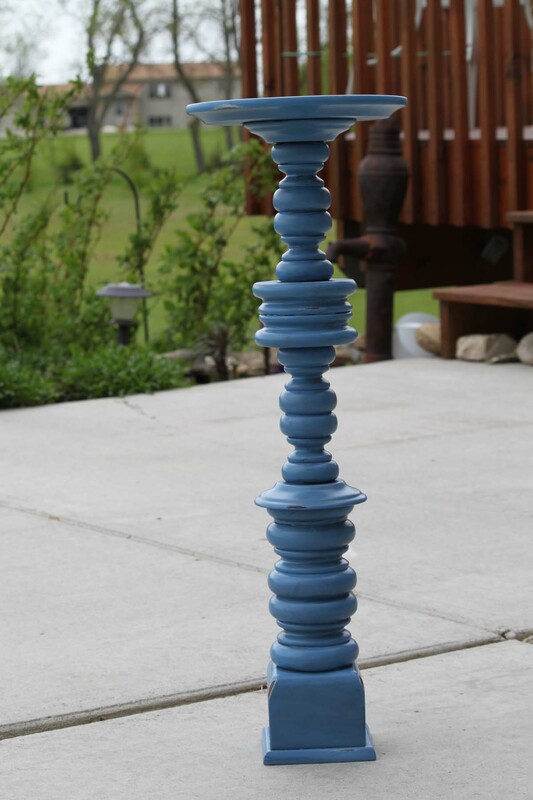 So this spring I put them together to create a funky, distressed plant stand. 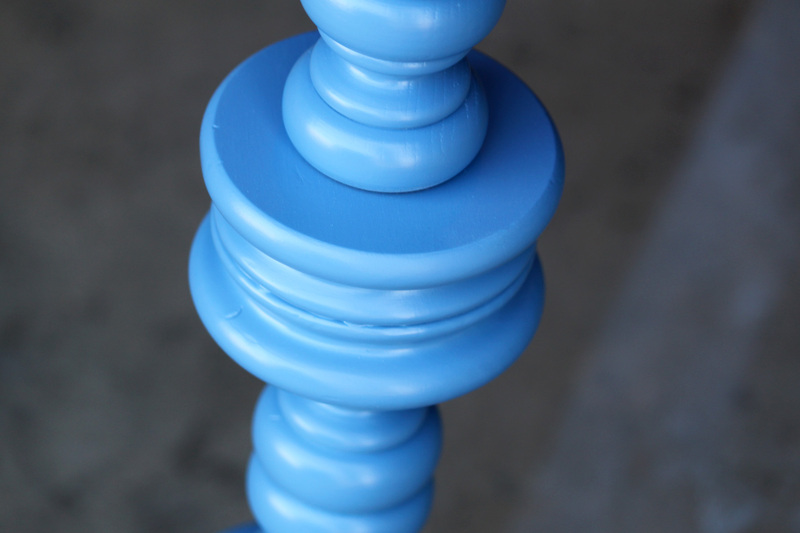 First I sanded the candlesticks down just a little bit. Then I glued them together with E6000 glue. Yes, I had to be patient and leave them overnight to let the glue set well. Then I primed and spray painted the stand. Just a little too flat, don’t you think? So I added some Valspar Antique Glazing. I got mine at Lowe’s. 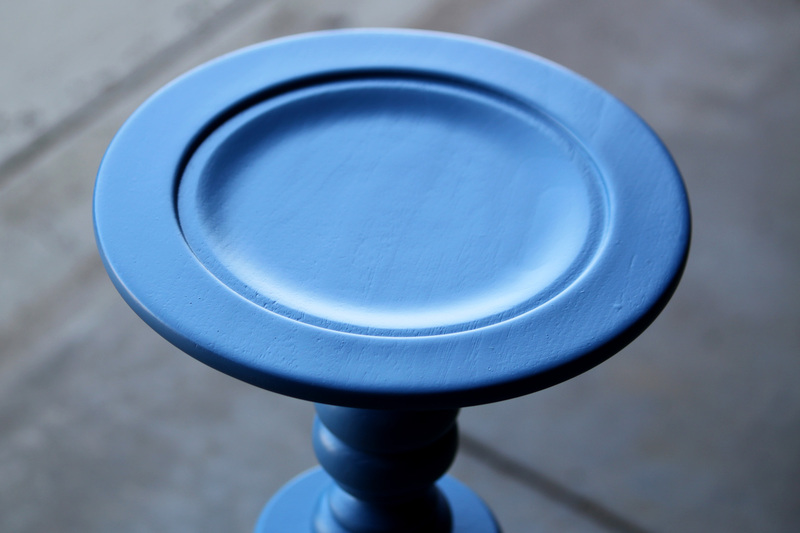 I have only used this glaze so I can’t speak for other glazes; however when I discovered glazing last fall is when I fell in love with spray painting. Before, I always felt like anything spray painted looked so flat, so dead. It looked, well, hand done. Then I read about glazing on several blogs, and I had to try it. 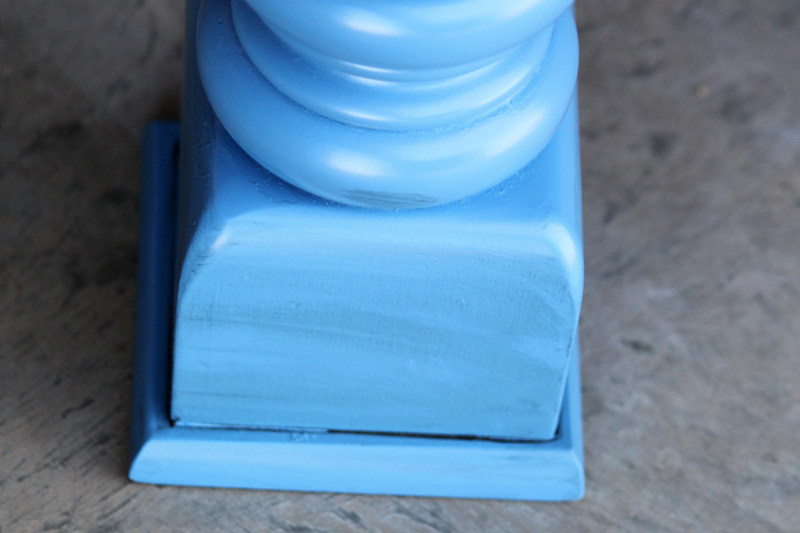 With glaze, you just rub on a generous amount and rub off as much as you would like. This project was completed right before I started my blog, so I didn’t take many photos. But the one above shows just a light glaze that I had left on. I hadn’t rubbed any into the cracks and crevices yet. But at least you get the idea. Glazing just messes up the flatness a bit or a lot depending on how much you want to leave. Once the glazing was done, I then took sand paper and distressed it all over so it looked more loved and used. This picture of the top might give you an idea of what I did with the distressing. As always click on the photo if you want to enlarge it. I really like this stand. I would use it for a plant stand or maybe hold a large candle. I have consigned this item, so I can’t take more photos to show you it a better. But you get the idea. 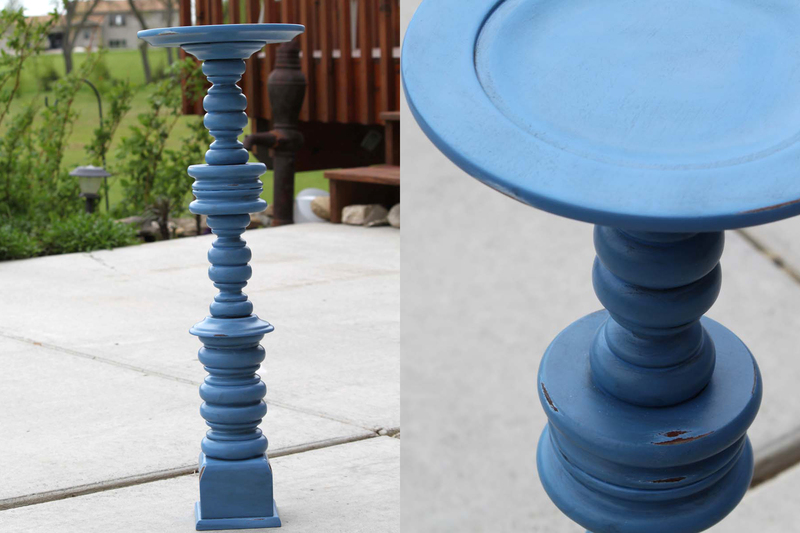 A new piece of furniture out of old, outdated, found, candlesticks and plates. No wonder I am addicted to thrifting when I can make something awesome out of pieces. 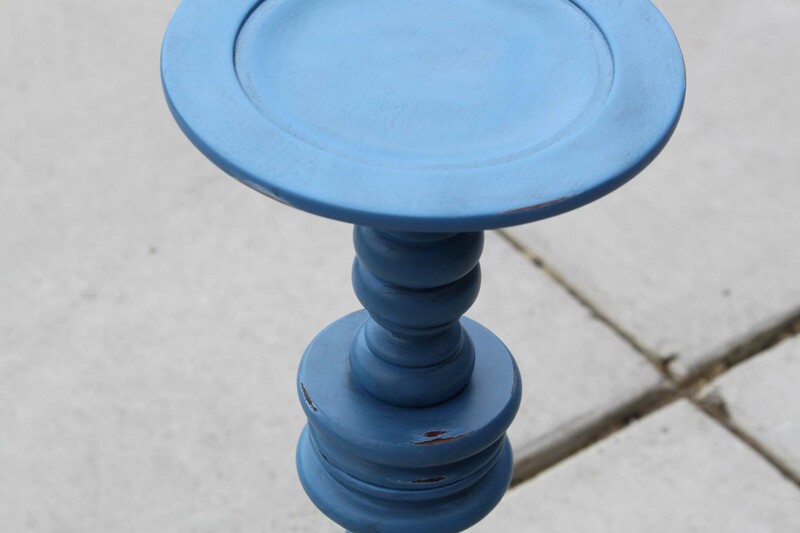 This entry was posted in Thirft Store Finds, Upcycle by Karen Grosz. Bookmark the permalink. Looks amazing! I really like that glazed look 🙂 Thanks so much for linking up to Thrifty Thursday! I really think glazing a piece makes all the difference in whether or not it looks flat. Love this idea! I love great thrift store finds!